WinX Free 3GP to iPod Converter is the best free 3GP to iPod converting solution that aids you to free convert 3GP videos to iPod player. Agrin Free 3GP MP4 to AVI FLASH WMV MOV Converter helps you convert MP4/3GP to AVI, MP4,WMV,MPEG,VOB,3GP, iPod, iPhone, Zune, Xbox, PMP, PSP, Apple TV, Pocket PC, FLV, SWF and MOV. Free 3GP Video Converter by Topviewsoft is a video conversion program that can convert batches of video files to 3gp 3g2 video files to be played on your mobile phone. Such as AVI to 3GP, Divx to 3GP, MPEG to 3GP, MOV to 3GP, FLV to 3GP, etc. Free 3gp Player is a simple player that can find and install correct codec if you don't have on your machine and play 3gp file. Free 3gp Player is a simple player that can find and install correct codec if you don't have on your machine and play 3gp file. It is simple to use and easy to install, It allows you to open and play an 3gp video file within three click. 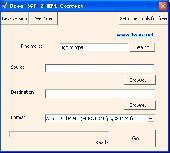 Free 3GP 2 OGG Lite is one of the best free conversion programs for converting your 3GP file to OGG format. Newpear Free 3GP 2 MPEG Converter Lite provides its users an easy way to convert 3GP file to MPEG format. OOO Free 3GP to SONY PSP Converter provides its users an easy way to convert 3GP file to SONY PSP format. Are you looking forward to an excellent and Free 3GP 2 Zen X-Fi Pro? With only one functionality: converting 3GP to Xbox, Free 3GP to Xbox SE is still a professional and wonderful program. With only one functionality: converting 3gp to Xbox, Free 3gp to Xbox SE is still a professional and wonderful program. This program can convert at relatively fast speed and give you the best output quality even though it is Free of charge. So don't hesitate, just download and convert! The interface is really user-friendly, you do not need any manual or tutorial at all. Free 3GP to MPEG-2 Fast Convert, as its name, is free and can be used to convert 3GP to MPEG-2. Free 3GP 2 MP4 Convert provides its users an easy way to convert 3GP file to MP4 format. mediAvatar Free 3gp Converter, as it is clear from its title, is an application that will convert your video files to 3gp video format for Free. It supports a wide range of input video files formats: AVI, MPEG, WMV, MP4, FLV, MKV, H.264/MPEG-4, DivX, XviD, MOV, AVCHD, TS, M2TS, MTS, H.264/MPEG-4 AVC, and many other HD/SD video formats.